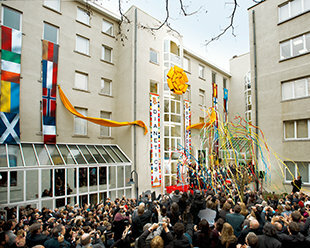 On January 23, 2010, dignitaries from across Europe joined with nearly one thousand Scientologists and well-wishers to mark the Grand Opening of the Brussels branch of the Churches of Scientology for Europe. After the opening celebration, guests toured the Church’s Information Hall where they were introduced to the works of L. Ron Hubbard. As Mr. Hubbard is the most translated author on Earth, the Church has literature available in every major European language and more. The Auditorium hosts all manner of congregational gatherings and also serves as a Chapel for Sunday services, Weddings and Naming Ceremonies. This early 20th-century landmark structure at Boulevard de Waterloo 100-103 in the heart of Brussels, will serve the spiritual needs of the people of this community and those throughout Europe. 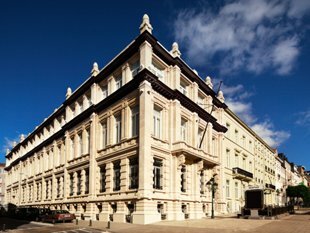 The entrance foyer of the new Brussels branch of the Churches of Scientology for Europe welcomes parishioners and visitors to its fully renovated home at Boulevard de Waterloo 100-103. The expansive Information Hall houses a multimedia exhibit describing not only Scientology’s beliefs and practices but the social betterment and humanitarian programs the Church sponsors as well. A special section of the Information Hall has been set aside to further acquaint visitors with the life and works of Church Founder, L. Ron Hubbard. This display is open daily to the public, year-round. An office of L. Ron Hubbard is maintained in every Church of Scientology on Earth. It stands as a sign of respect and a statement that each Church remains true to his spiritual teachings. Dianetics and Scientology introductory films are shown to visitors and parishioners in the film room near the Information Hall. At the Documentation Center on the Church’s first floor, visitors will find a wide array of books and other materials both written about and authored by L. Ron Hubbard. The grand staircase in the new Brussels Church rises from the lobby to the first floor. This is the view from the Church’s lobby via the grand staircase. Great care was taken to assure that each detail of this structure was restored, elevating the building beyond its original splendor. Nearly 1,000 Scientologists and their guests from across Europe attended the dedication of the Brussels branch of the Churches of Scientology for Europe on January 23, 2010. A representative of Church of Scientology International, the Mother Church of the Scientology religion, officiated at the ceremony held in the early-20th-century historic structure at Boulevard de Waterloo 100-103. The event marked the beginning of a new era for Scientology parishioners and all residents of Belgium and Europe, for it is from this Church that Scientology will deliver L. Ron Hubbard’s effective solutions to uplift society on behalf of all. Distinguished guest speakers participating in the dedication included the Honorable Hugo Coveliers, Senator in the Belgian Parliament; Professor Abolfazl Beheshti, Professor of International Relations and Energy Economy at the University of Lille, France; the Honorable Juan Ferreiro, Deputy Director General for Religious Affairs at the Spanish Ministry of Justice; Ms. Katalin Szomor, expert member of the Drugs Commission of the Hungarian Parliament and former National Drug Coordinator; and the Reverend Christopher Vonck, Rector of the Faculty for Comparative Study of Religions at the University of Antwerp. In his address to the Scientologists and guests, Senator Coveliers declared, “This new Church in the capital city of Europe stands as a beautiful testament to your help, and you can be certain of my continued support. You care for people, and this Church is such an example of this attitude." The new Church in Brussels has undergone extensive renovation not only to accommodate all Scientology religious services but also to provide the community services and humanitarian programs of Church members. The 88,000-square-foot Church includes an expansive Information Hall housing a multimedia exhibit describing the religion’s beliefs and practices and the life and legacy of Scientology Founder L. Ron Hubbard. All Church-sponsored humanitarian and social betterment programs are also presented here, including Scientology’s answer to crime, drug abuse, illiteracy, declining moral values and natural disasters. These programs represent the work of Churches of Scientology in servicing every community in which they reside as well as other communities the world over. Also representative of this new Ideal Church is an accommodating chapel for congregational gatherings, which also serves as a chapel for Sunday services, weddings and naming ceremonies; a Documentation Center containing the written and spoken materials of L. Ron Hubbard; rooms for religious training and religious counseling; and Public Affairs offices to coordinate human rights initiatives across Europe with like-minded organizations.